Carta Esferica de los reconocimientos hechos en 1792 en la Costa N.O. de America para examinar la Entrada de Juan de Fuca, y la internacion de sus Canales navegables levantada de ordern del Rey Neustro Senor abordo de la Goletas Sutil y Mexicana. This is an uncommon 1871 reissue of a 1795 map of Vancouver Island, Washington, and British Columbia by the Spanish navigators Dionisio Alcala-Galiano and Cayetano Valdes. Alcala-Galiano and Valdes led the last important Spanish exploratory voyage to the Pacific Northwest. Though the Spanish navigators reached the region around the same time as Vancouver, their maps were not officially published until five years later, after Vancouver's work had already established the nomenclature of the region. Nonetheless, many scholars consider their work to be superior to Vancouver and believe it deserves greater recognition in histories. 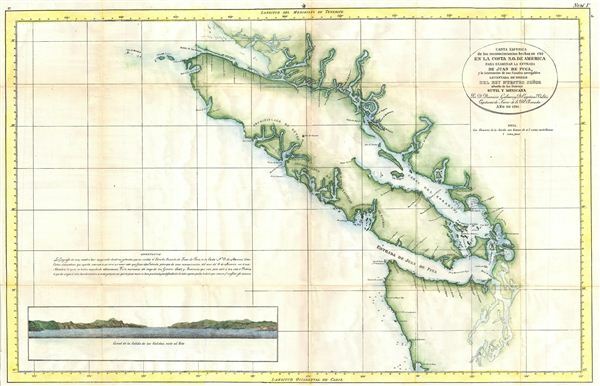 The map covers form the northern tip of Vancouver Island south as past the entrada de Juan de Fuca to Port Gray (Puerto de Gray) and includes much of the Puget Sound. The elusive eastern coast line of Vancouver Island is only tentatively mapped. A shore profile showing the Goletas, appears in the lower left quadrant. This map is an 1871 reissue of a scarce Spanish government map. Dionisio Alcalá Galiano (October 8, 1760 - October 21, 1805) was a Spanish naval officer, cartographer, and explorer. Born in Cabra, Córdoba, Spain, in 1760, Galiano entered the Spanish navy in 1771, at the age of 11. After several years at sea he enrolled in the Spanish naval academy in 1775 and upon graduating in 1779 entered active service. In 1784 Galiano met and worked with Alessandro Malaspina, with whom he would later journey to America. Both men were among a group of officers studying astronomy at the Royal Observatory in Cádiz under Admiral Vicente Tofiño. Thought association was brief, when Tofiño was called upon to create an atlas of the coast of Spain, and he chose Galiano to work on the project. Thus Galiano assisted Tofiño's great hydrographic study, which resulted in the 1789 i>Atlas Maritímo de España. This experience was the basis of Galiano's expertise as a professional cartographer. Subsequently, taking advantage of the just developed marine chronometer, Galiano produced some of the first accurate maps of various coastlines in Europe and the Americas, including the Strait of Juan de Fuca, the Strait of Georgia, and Vancouver Island. He reached the rank of brigadier and died in the Battle of Trafalgar. Cayetano Valdés y Flores Bazán (1767-1835) was a commander of the Spanish Navy, explorer, and captain general who served in the French Revolutionary and Napoleonic Wars, fighting for both sides at different times due to the changing fortunes of Spain in the conflict. He took part in a number of naval battles, including the Great Siege of Gibraltar, the Battle of Cape St Vincent, and the Battle of Trafalgar. He was an explorer, most notable in the Pacific Northwest, where he and Dionisio Alcalá Galiano conducted the first circumnavigation of Vancouver Island, in partial cooperation with George Vancouver. Over his long career he achieved the highest ranks in the Spanish Navy, eventually being named Captain General of Cadiz and Captain General of the Spanish Navy. Very good. Minor wear on original fold lines. Blank on verso. Catalogue of Maps from the Royal Geographical Society, p. 337.